In truth Alfred Tuck spent very little time in Yeovil. He was born in 1895 in Speckington, Somerset, the son of farm carter John Tuck (b1871) originally from Clapton, Somerset, and Eliza Ann Bollen, known as Annie (1873-1956). John and Annie had seven children; Florence Lily (b1883, Bradford Abbas, Dorset), Alfred Charles, Arthur (b1898, Aldon), Dorothy Maud (b1900, Bradford Abbas), Edwin Frank (1902, Over Compton-1979), William Wilfred (1904, Rowlands Farm, Devon-1985) and Ethel Evelyn (b1908, East Coker). As seen by the birthplaces of the children, the family seemed to move around from farm to farm and in the 1901 census John, Annie and their four eldest children were listed at Over Compton, Dorset. John was still listed as a 'Carter on Farm' while Alfred was a 'Carter boy on Farm'. Alfred enlisted in Yeovil although it is not known when. He joined the Royal Field Artillery, Service Number 148714, and was in 'D' (Howitzer) Battery, 71st Brigade. This brigade was originally comprised of numbers 223, 224 and 225 Batteries RFA and the Brigade Ammunition Column. It was placed under command of the 15th (Scottish) Division and moved to France with it in July 1915. The brigade remained with 15th (Scottish) Division throughout the war. On 7 June 1916 D Battery left to join 73 (Howitzer) Brigade of the same division, and became that brigade's C Battery. It was replaced in 71 Brigade by C Battery from 73 (Howitzer) Brigade, which now became 71 Brigade's 'D' (Howitzer) Battery. It is likely that it was around this time Alfred enlisted. On 22 January 1917 a section of two howitzers from 532 (Howitzer) Battery of 72 Brigade joined and was added to D (Howitzer) Battery. In 1917 'D' Battery, including Alfred, was in action at the First Battle of the Scarpe (9 to 14 April 1917) which was part of the Arras Offensive. This action was followed a week later by the Second Battle of the Scarpe (23 to 24 April 1917). On 23 April, the British launched an assault east from Wancourt towards Vis-en-Artois. The British made initial gains but could advance no further east and suffered heavy losses. Farther north, German forces counter-attacked in an attempt to recapture Monchy-le-Preux, but British commanders determined not to push forward in the face of stiff German resistance, and the attack was called off the following day on 24 April. The Brigade than moved north to Flanders where it again saw action during the Battle of Pilckem, part of the Battle of Passchendaele. Two weeks later Alfred saw his last action in the war, the Battle of Langemarck. The Battle of Langemarck from 16–18 August 1917, in which 'D' Battery, 71st Brigade - including Alfred Tuck - took part, was the second Allied general attack of the Third Battle of Ypres. The battle took place near Ypres in Belgian Flanders on the Western Front. The Allied attack succeeded in the north, from Langemarck to Drie Grachten ("Three Canals") but early advances in the south on the Gheluvelt Plateau were forced back by powerful German counter-attacks. Both sides were hampered by rain, which had a greater effect on the British who occupied lower-lying areas and advanced onto ground which had been frequently and severely bombarded. 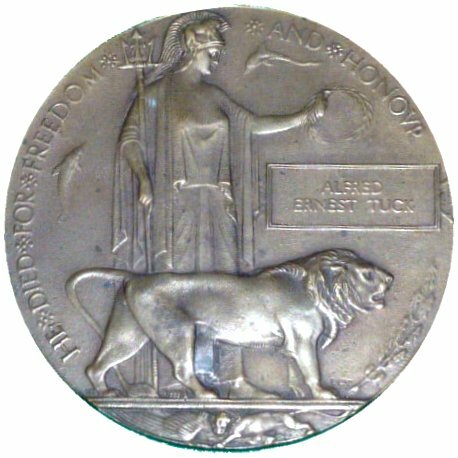 Alfred was mortally wounded on the first day of the battle, 16 August 1917, and died from his wounds. He was 22 years of age and was interred at Brandhoek New Military Cemetery No 3, West-Vlaanderen, Belgium, Grave II.B.11. 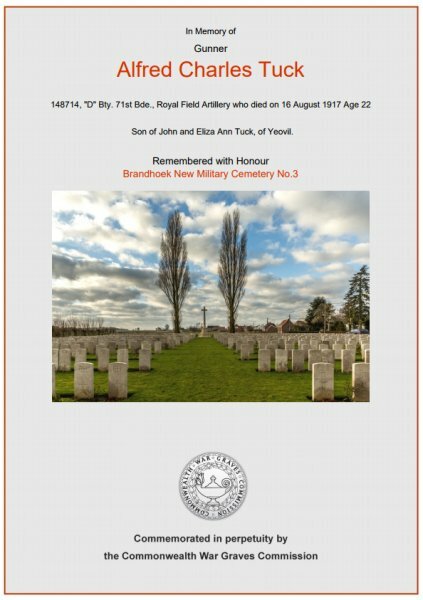 In its edition of 31 August 1917 the Western Gazette reported "Mr and Mrs John Tuck, of 26 Cromwell Road, Yeovil, have received official information that their eldest son, Gunner AC Tuck, of the Royal Field Artillery, has been killed in action in France." Alfred Tuck's name is recorded on the War Memorial in the Borough. Albert Burgess, Harold Dicks, Robert Fry and Frederick Hunt. The Memorial Plaque commemorating Alfred Tuck. Also known as Death Plaques, the plaques were made of bronze, and hence popularly known as the "Dead Man’s Penny", because of the similarity in appearance to the somewhat smaller penny coin. Diameter approx. 120mm, rim thickness approx. 4mm, weight approx. 333g. 1,355,000 plaques were issued, which used a total of 450 tons of bronze. They continued to be issued into the 1930s to commemorate people who died as a consequence of the war. The Commonwealth War Graves Commission certificate commemorating Alfred Tuck. 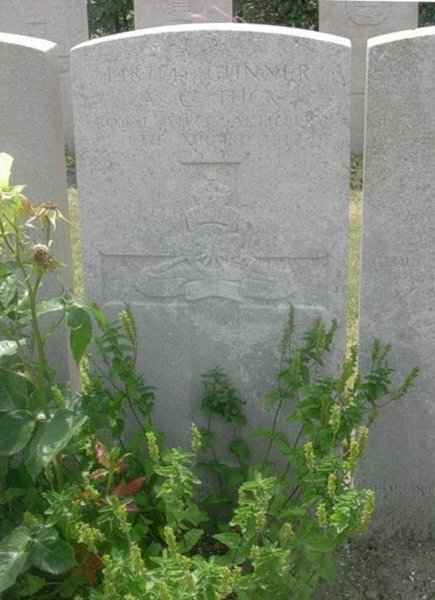 Alfred Tuck's headstone at Brandhoek New Military Cemetery No 3, West-Vlaanderen, Belgium.